Rated PG-13 for greedy ghosts squishing internal organs. LOVED this story. So sweet, so funny. 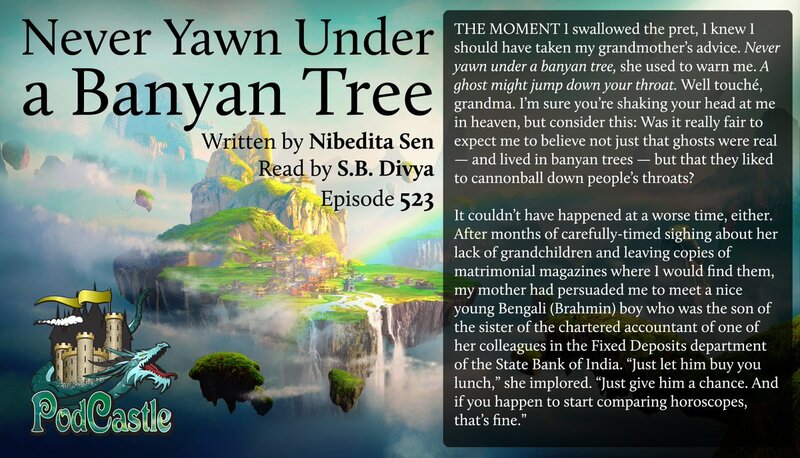 Made me go looking for more by Nibedita Sen! I also quite liked this episode. Listened to it twice already. This was delightful! Kudos for the narration as well, especially for choosing to give the ghost an accent. Having struggled with IBS for six months, I empathized heavily with the hungry ghost while I nibbled my plain rice. Best wishes for Meena and Rupsha! I hope Meena asks her out! Excellent story and excellent narration. Two thumbs up! There were many things hinted at in this story, political, fantastical, personal, and culinary, which all combined to make a well balanced world full of relatable and realistic people. I enjoyed it!